Even if it seems that tradition existed for centuries, it is interesting to pause and ask yourself a question: “When did it all start?” So, when was the first Christmas card created and who came up with the idea? Have you ever gently pressured your grandma to through away her out-of-control collection of Christmas cards she has been lovingly cherishing for years? You may consider putting it in a safe deposit box… A Victorian Christmas card, one of the first Christmas cards mailed in Britain, was sold for a record £22,500 at an auction in 2001. 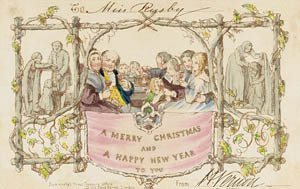 This Christmas card, depicting a controversial scene of a family sharing festive meal and wine with small children, was commissioned by entrepreneur Henry Cole and designed by John Callcott Horsley. Out of couple thousands that were lithographed it is believed that about a dozen cards survived. So, check your attics! What were the most popular images on these first Christmas cards? They rarely showed religious scenes but elaborate flower designs, cupid-like children with rosy cheeks and angel Christmas cards were popular. Their fancy design featured gold, embossing, calligraphy, different shapes, clever pop-ups and high-quality printing materials and paper. One of the first mass-producers of greeting cards in America, Louis Prang, is credited for devaluing quality in attempt to make a profit. Growing popularity of Christmas cards caused their mass production and cheap imitations of Victorian era masterpieces flooded the market. 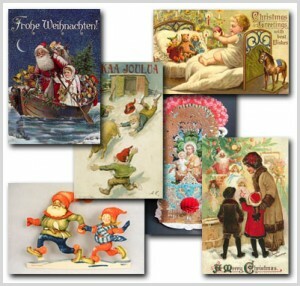 Early in the history of Christmas cards in XIX Europe, Germany was dominating greeting cards printing business, saturating the market with cheap Christmas cards, often using photographic methods. Pretty-looking young ladies sending greetings and rosy-cheeked angels surrounded by flowers replaced fragments of Nativity scenes with Jesus in the manger or Magi and quotes from the Bible. The design of the commercially-produced cards changed with the tastes of consumers and evolved later to depict religious scenes and messages along with Santa Claus, reindeer, snowmen, and tree decorations. In Scandinavian countries kind gnomes and elves are popular messengers of holiday greetings, while practical Swedes prefer hand-made Christmas cards as applications and drawing made by kids as their holiday craft projects. In XIX century clever Russian merchants imported Christmas cards from Europe buying only the ones without greeting inside. The message was added later before distributing them to consumers, often by hand which was labor-intensive. In 1898 Russia established its own printing of greetings cards, mostly for Christmas and Easter (Pascha). Famous artists, such as Rerich, Bilibin, Bakst, were commissioned to produce the images: first Christmas cards depicting traditional Russian three-horse carriages ‘troika’, kids singing carols, and winter villages sleeping under white snow blankets. Easter cards grew in popularity with images of churches, traditional Pascha bread (kulich), sweet cheese (pascha), and brightly colored eggs being blessed by priests in a traditional prayer service. It is important to note that Orthodox church was opposed to holy images being mass produced on paper and concerned that Christmas cards containing printed icons would be thrown in the garbage after the holidays. In 1917 the communist revolution tried to axe religion from life: as religious holidays were substituted for new ones, Christmas was no longer celebrated and Christmas greeting cards were replaced with ‘New Year’ cards featuring Ded Moroz (Father the Frost) and his granddaughter Snegurochka (Snow Girl). The was even a war on Christmas tree, calling it a rudiment of capitalism. Official New Year card would feature Kremlin with red stars on its towers, clock ready to strike 12, and happy families celebrating the holidays. There were also funny greeting cards with Ded Moroz flying into space, playing hockey, and delivering bags of presents to happy children. Orthodox icons were forbidden in communist Russia and were often confiscated if found at the border entrance points. It is interesting that icon cards printed on paper were easier to smuggle into the country and easier to hide, so they became a popular alternative to traditional icons on wood. At that time paper greeting cards featuring old Byzantine icons printed in Bulgaria became popular orthodox Christmas gifts. 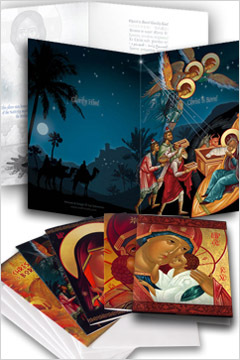 The revival of religious freedom in Russia in 1990s brought a new life to Christmas and Pascha greeting cards production, featuring reprints of pre-revolutionary greeting cards and new designs. Christmas cards would depict old churches with golden cupolas and crosses, Nativity icons, both ancient and modern, along with secular images that people grew accustomed to during 70 years religious oppression: decorated trees, Santa Claus / Ded Moroz, candles, and winter landscapes. Political correctness and desire not to offend anyone brought to life such signs of our times as corporate ‘Season’s Greetings’ cards stripped of any religious symbols or Christmas associations. Millions of such cards are mailed by businesses to their clients each holiday season as a way to say ‘thank you’ for business, remind their clients of services offered, and as an attempt to advertise new year specials. Environmental impact of printing, raising costs of mailing and concerns over disposing of greeting cards raised consumer awareness and gave birth to a new media, e-cards. Some of them feature a short animation piece in addition to digital graphics and messages, making them a popular alternative to traditional printed Christmas card. Numbers of printed greetings cards have dropped significantly: American household received an average of 29 cards in 1987. How many cards did you get last year—less than 10? Though postal services report ~ 750,000 million Christmas cards are mailed each holiday season, the raising costs of first class stamps would force a lot of us to go over that Christmas mailing list with a red marker. Does this mean that the history of Christmas cards printed on paper is seeing its last chapter? Quality greeting cards that are educational, original in design, and carry heart-felt messages from our loved ones are still treasured pieces of art in our everyday life.